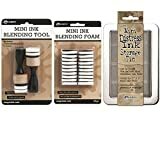 After seeing all the beautiful snowflake cards using Catherine Pooler's new kit Stamp of Approval Holiday, I was inspired to look through my stash of stamps. I really wanted to pick up the kit but at this time I just can't, so I found this beautiful set I had purchase a couple of years ago from Unity Stamps called Snowflake Kisses. I stamped some of the snowflakes and sentiment in versamark on white cardstock and embossed. 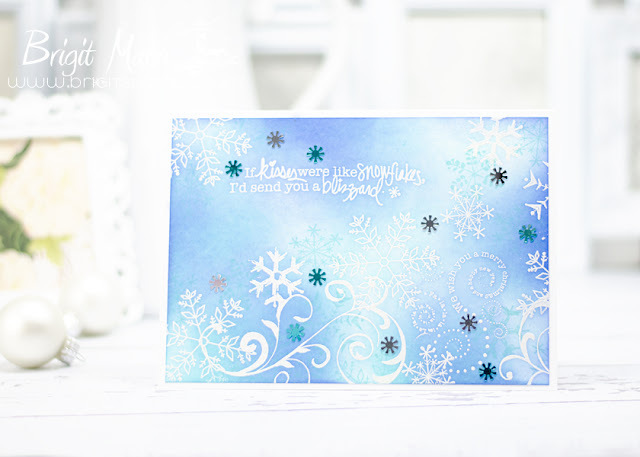 I used some Distress Ink to sponge the background and then stamped a couple of more snowflakes in Lawn Fawn Mermaid Ink. I added a couple of snowflake sequins I bought at Michaels and mounted the card base on a 5 x 7 card. The one flourish came from another Unity set. That is really pretty! I love the sentiment!